This is aNOTHER jam-packed yoga post (see previous one) with 3 reviews and a giveaway. Read or at least scan all the way to the bottom. Upfront disclaimer: I received a free sample of the first two products for purposes of sharing my honest opinions. What would I do if I had (1) keen artistic talent, (2) a wicked sense of humor, (3) a deep understanding of yoga's benefits? Hmmmm....maybe I would do what Amy Luwis did: create Yoga to the Rescue, a deck of 48 cards that can be read like a book or be used as, well, a rescue for what ails you. For each section, Amy suggests several sequences of poses. You can then build your own yoga flow that provides you exactly what you need. Each card shows one pose, and includes the Sanskrit name, the Western name, an amusing drawing, a modification should you need a "partway" pose, a diagram and explanation of how to get INto the pose, its benefits and focus points. I learned factoids I had not known before. I join both Liz Phair and the Washington Post in giving Yoga to the Rescue a big thumbs up. Whether you have a latent or enduring interest in yoga, I think you'll enjoy this deck/book. $18, or 2 for $32 at RescueGirl.com / $11 at Amazon. Yoga to the Rescue is also available as an iPhone app. How cool is that!? I previously reviewed a Bliss Wood CD, and this one also earns a thumbs up. Bliss gently leads you through 12 Hatha Yoga poses for an hour-long session, including warm up, stretching of hips, legs, shoulders, back and abdomen, some lunging, and final relaxation/meditation. They key word is gentle. The CD insert includes photos of the poses so you can get an idea of what each asana looks like. It's a terrific tool for someone new to yoga or someone who would like to be guided at home. $17 on the Bliss Wood website; also available at Amazon, where you can listen to sample tracks. How did I not know about this? Luckily, my new friend Dez (a new mom and mompreneur) clued me in. YogaToday is a website that offers full yoga sessions -- gorgeous videos set in Jackson Hole, WY. You go to the site and can bring up a huge selection of full yoga classes to view at your leisure -- a new one is made available each morning. Great for when you're traveling, can't get to a yoga studio, or just want to give yourself a spur-of-the-moment class. Here's an 11 minute sample. Check out the scenery. I have subscribed to the YogaToday blog. Two or three times a week I get a shorter video that focuses on a certain issue: arm balances, hip openers, a lesson on bandhas (remember "rootlock"? -- see comments) and others. And it's all FREE! Giveaways for everyone! RescueGirl is offering freebies to 5 lucky readers. One deck is available, as well as one download code for each of the iPhone/iTouch apps (YogaSexy, YogaRemedy, YogaBliss and Everyday Fabulousness). Codes can be used by you or given as a gift. The first commenter picked by random.org will get first choice, and so on, until all five prizes are given. Leave a comment below by 6 am MDT on June 22, stating your preference. We'll let winners know either in this space or by email (if available). The deck/app codes will be sent directly from RescueGirl herself, Amy Luwis. You can get extra entries by tweeting this post (if you're already on Twitter, just click the ReTweet button at the bottom of this post), by linking to this post on your own blog, or by putting the All Thumbs button on your blog. Just come back to let us know where to find your shout-outs. Thank you so much for telling your friends about All Thumbs and spreading the word on your blog with this button so that we can keep these giveaways coming. Random.org selected # 9, 2, 11, 13, 4. Which means I am trying to reach Kymberli, LJ, Lilith, Peggy, Danielle. Congrats, ladies, and thanks to all for entering. Stay tuned for more sassy reviews of sassy stuff. Used to sell the yoga to the rescue decks...they are AWESOME. And since I don't have an iphone I think should e my choice...I tweeted too! I've seen the Yoga Deck and think it looks so cool! This RescueGirl yoga deck, this yoga CD and the yogatoday.com website are all GREAT yoga tools when you travel! 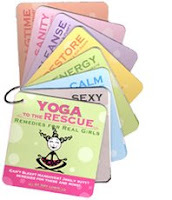 I'd love to win the RescueGirl yoga deck! Looks like a great tool to help me with poses! Love the idea of Everyday Fabulousness!! Button, button, who's got the AT button, that would be MOI!! Thanks!! The witticism of "ragtime" has me rolling. I did yoga once a few years back and it nearly killed me. I have a mission to try it again and make it a regular part of my exercise routine and so far, all I've done is what Wii Fit has to offer. Should I be so lucky to win, I prefer the deck. this is an awesome give away. love rescue girl!! I have a quiet space and now... a great way to use this! I really like the rescue deck, ragtime...too funny. I don't have an iPhone or an iPod but count me in anyways please. thanks! The rescue deck is so neat and my daughter would love it! Thanks for the chance! I would love to win a deck! So cool!